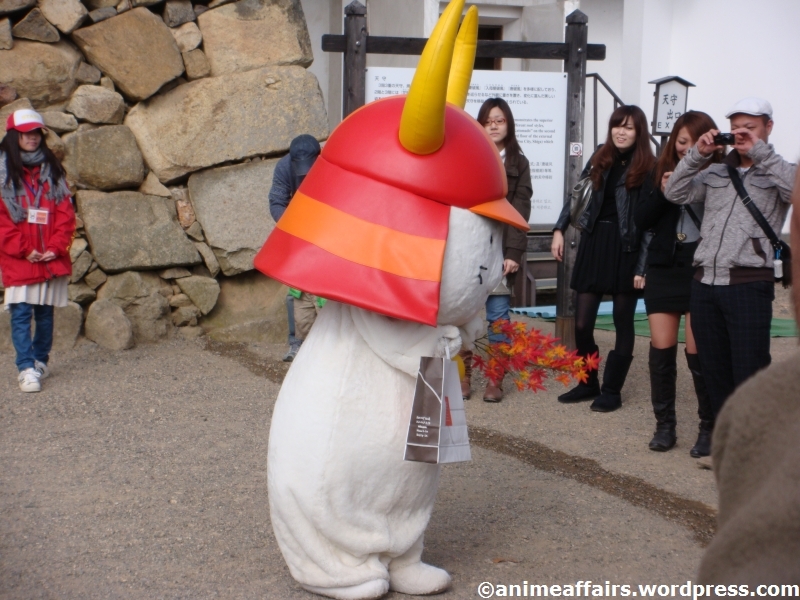 Time to redress my long neglect of this blog and serve up a slice of Diego’s autumn 2010 visit to Japan. 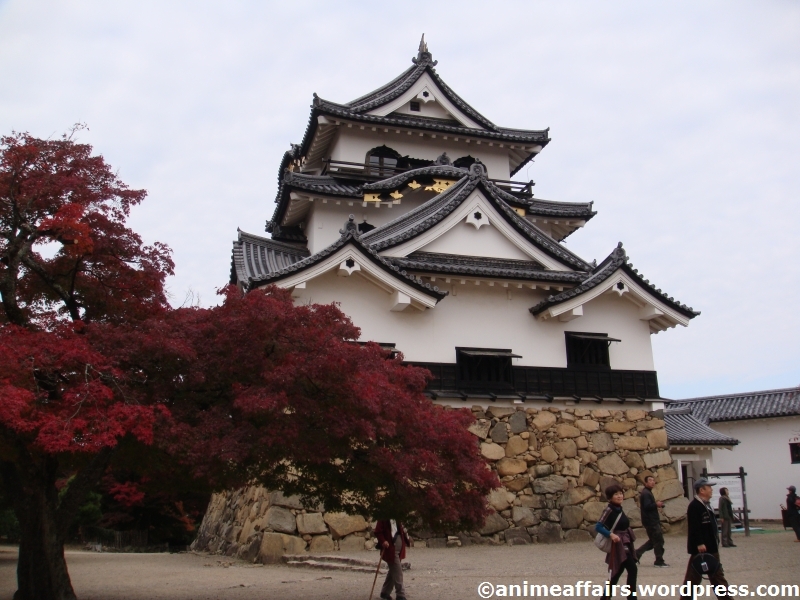 Today, the spotlight falls on Hikone-jō – one of Japan’s few intact ancient castles. 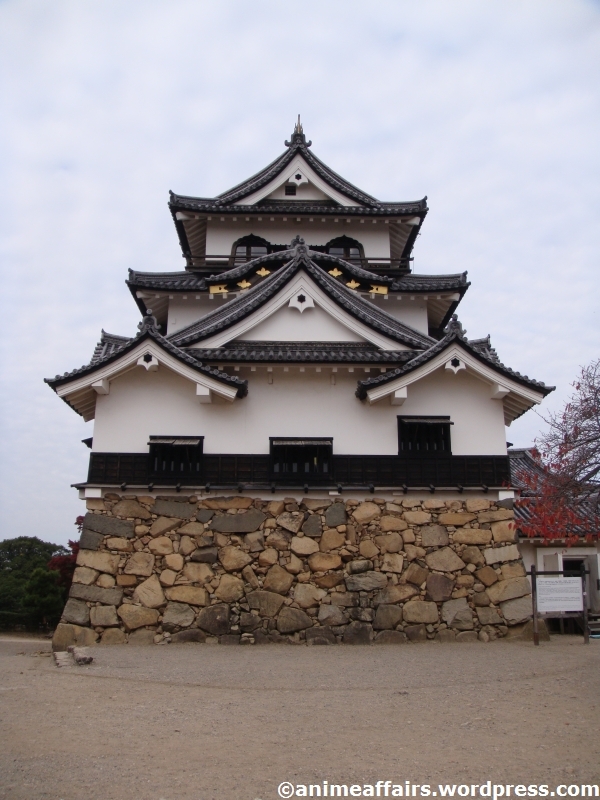 From Kyōto Station, a 20-minute shinkansen trip to Maibara followed by a 5-minute ride on a local train takes us to the quiet city of Hikone, in Shiga Prefecture. Not much to see in or around the station of course, but as we’re not railway enthusiasts – feel free to stick around here and admire the signal lights if you are – then it’s up the road with us towards the heart of town. The walk will take us about a quarter of an hour, so let’s kill time by sharing some background information. 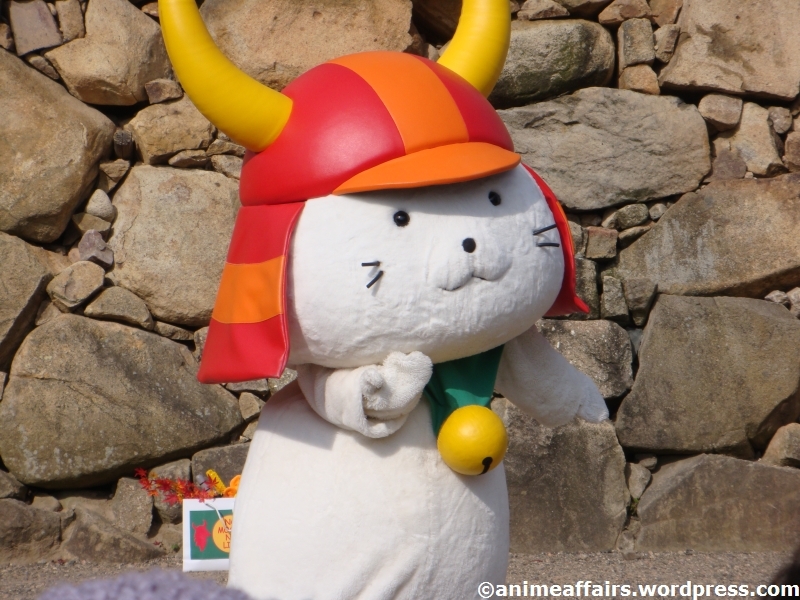 Skipping the details – of which the Wikipedia article has plenty (both verified and otherwise) – we come right to one question: why is Hikone-jō such a major tourist draw, despite its diminutive size? I can think of two reasons. 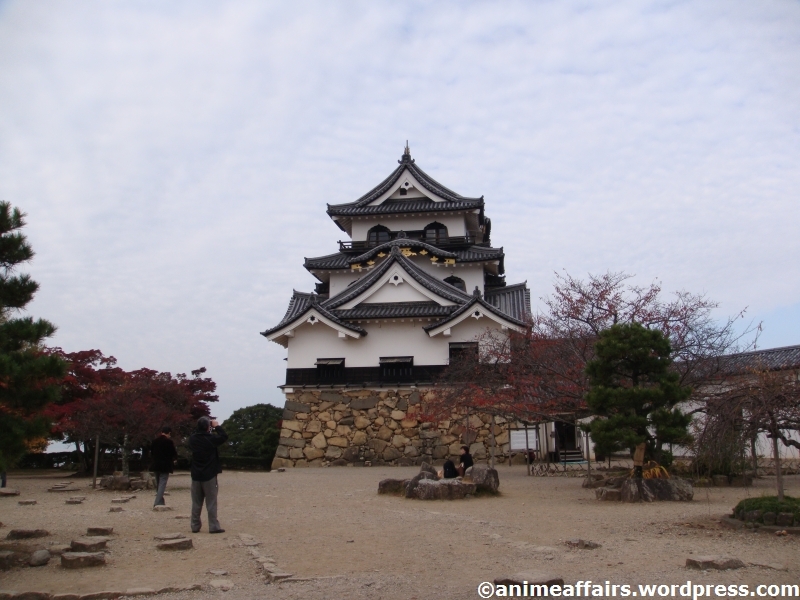 First: unlike most of its fellow Japanese castles, Hikone-jō is the real deal. 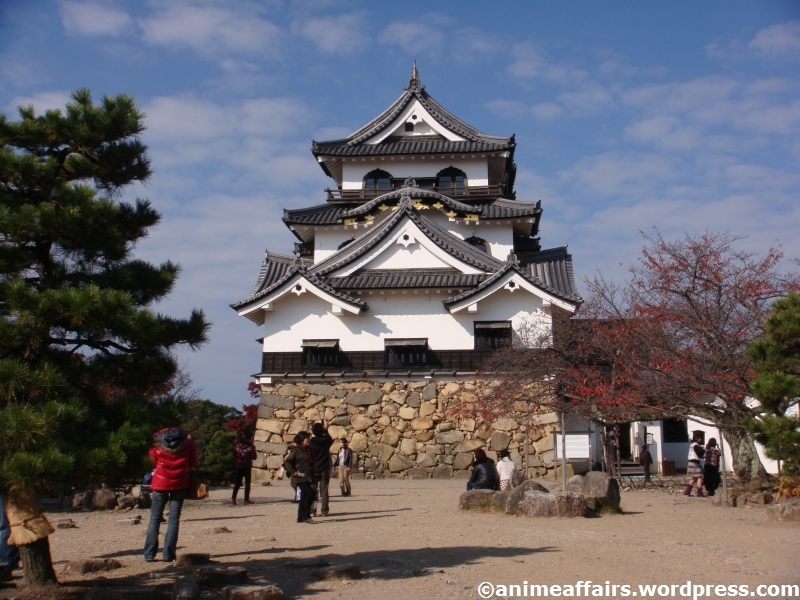 Completed in the 1600s, this fortress has survived centuries of wind, rain, revolution, and bloodthirsty in-laws more or less intact, whereas many of the nation’s castles are ferro-concrete reproductions built in the decades after the Second World War. 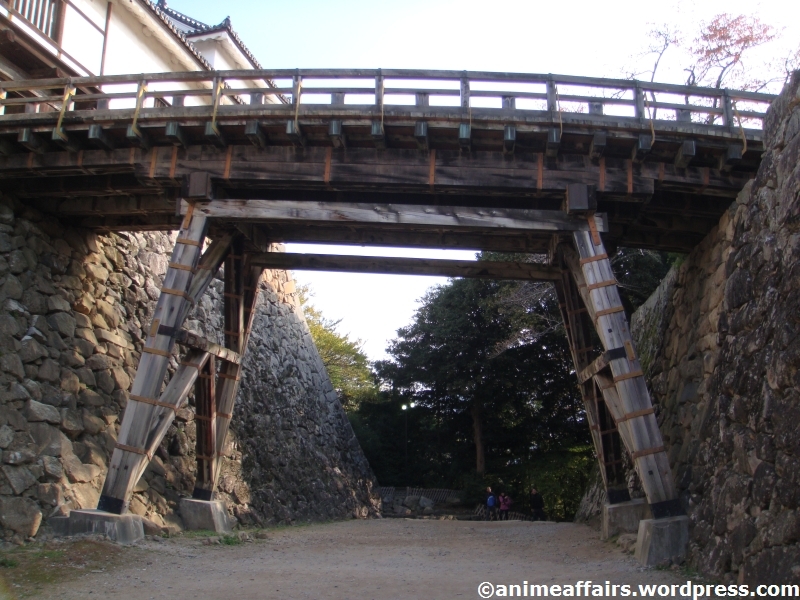 (A good chunk of them had bitten the dust during the Meiji period; others had been blasted into matchsticks by wartime bombing.) 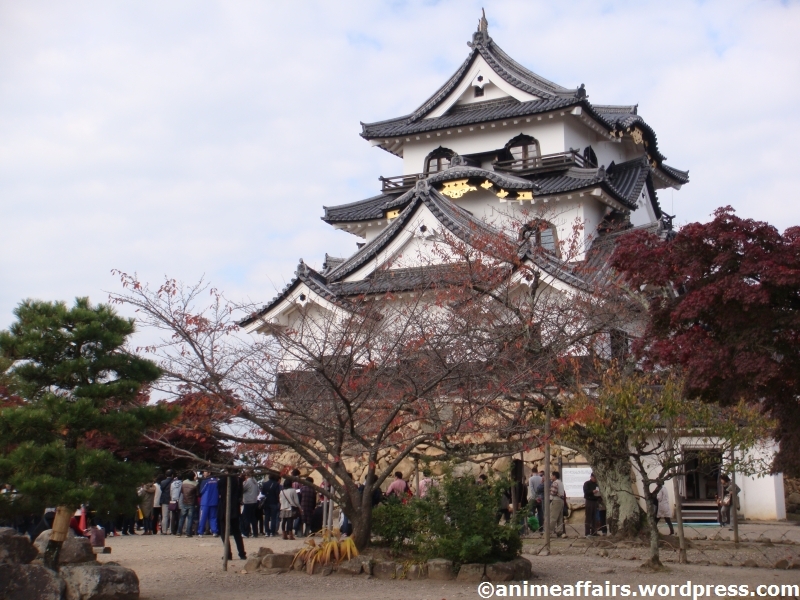 With its not-too-distant neighbour Himeji-jō, Japan’s most spectacular feudal-era castle, currently hidden behind scaffolding for restoration work until 2014/2015, Hikone-jō will probably rise even further in the itineraries of tourists visiting the region. 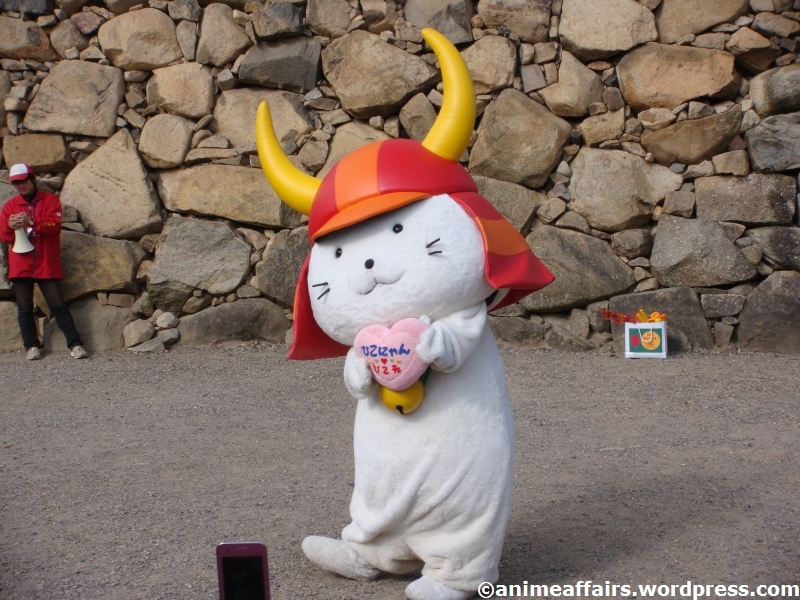 Second: its resident cat is a huge celebrity in Japan. More on him later. All right, not much further now. 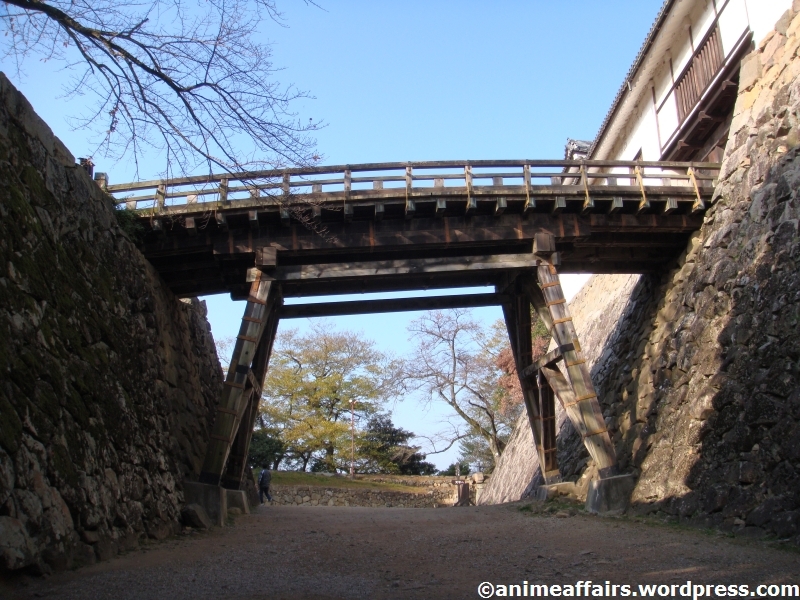 Let’s cross this bridge over the castle’s outer moat and pass through one of its formidable gates. 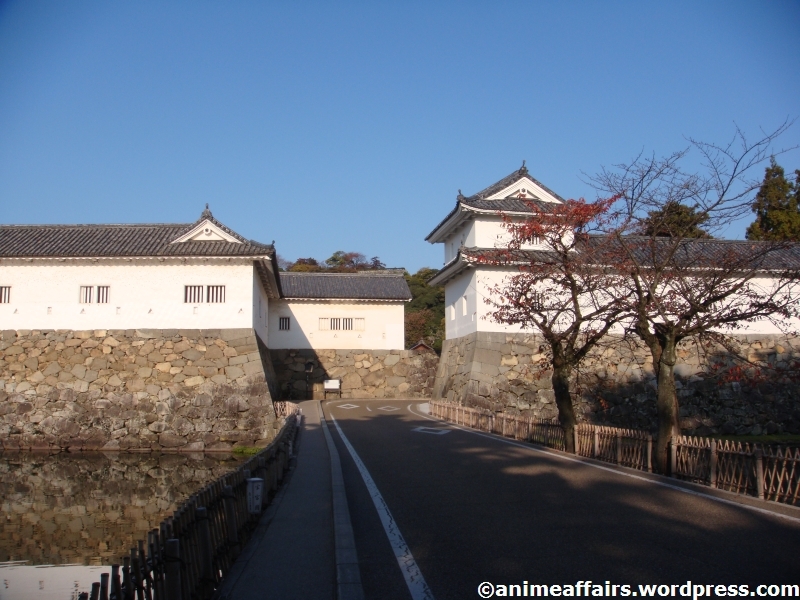 Beyond the gate, we turn left at the old castle stables, walk across the wooden bridge spanning the inner moat and head for the main entrance to the castle compound. 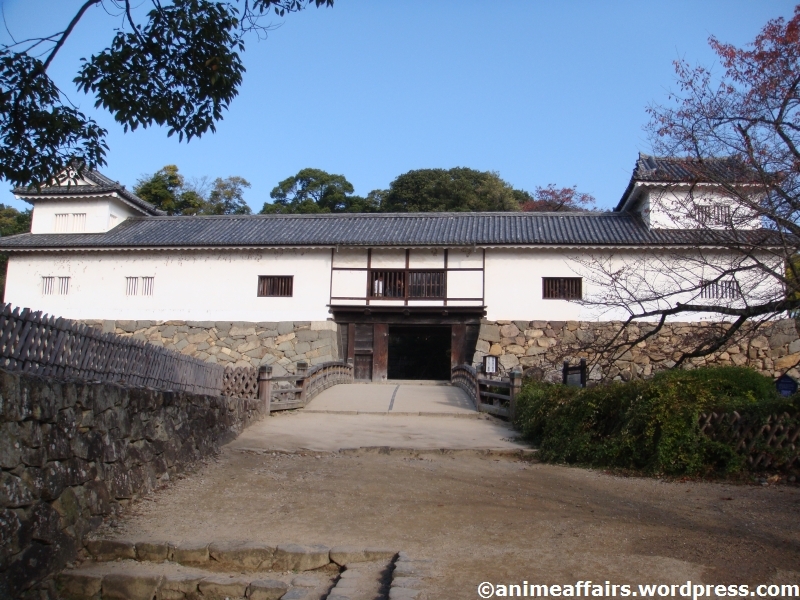 At the foot of the hill on which the castle stands is the Hikone Castle Museum, housed in a reconstruction of the feudal lord’s palatial residence. 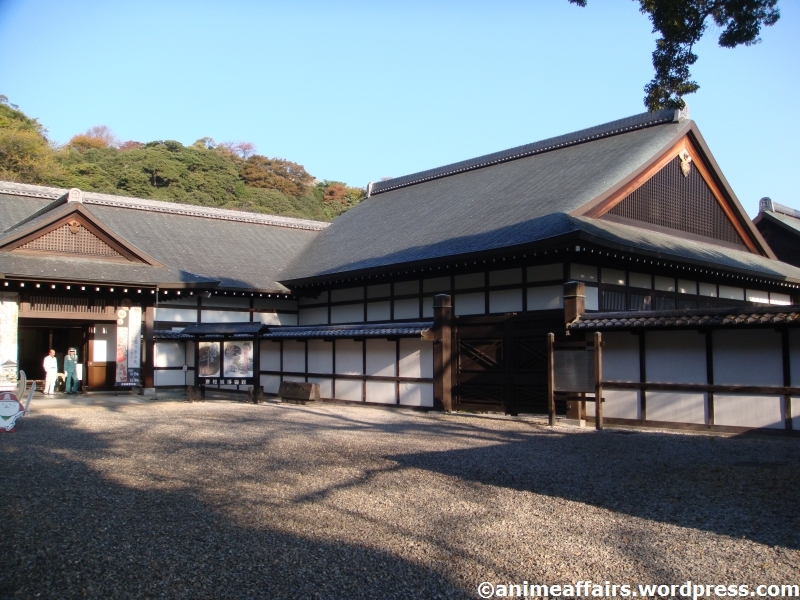 The museum features an impressive collection of historical artefacts related to the Ii family who once ruled this domain, as well as faithful recreations of some of the palace’s elegant living quarters (complete with wooden Nō stage). 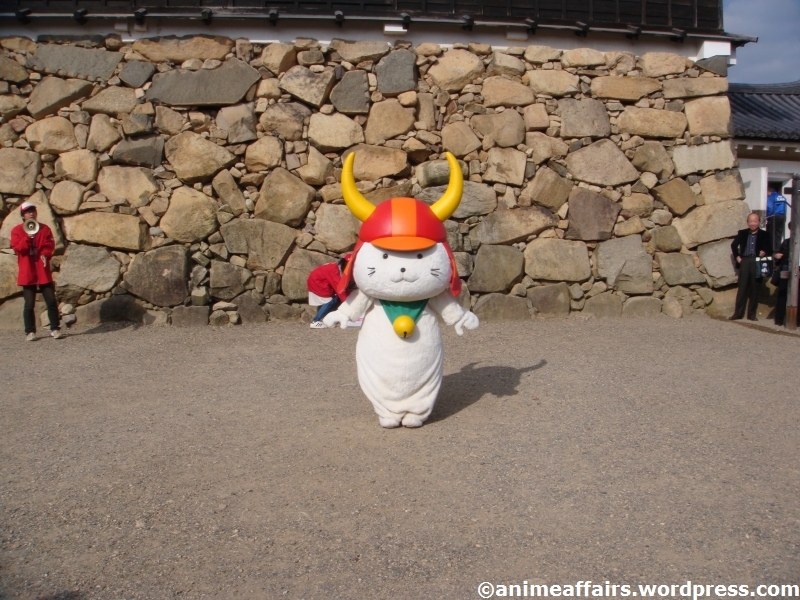 Now let’s head for the castle keep. 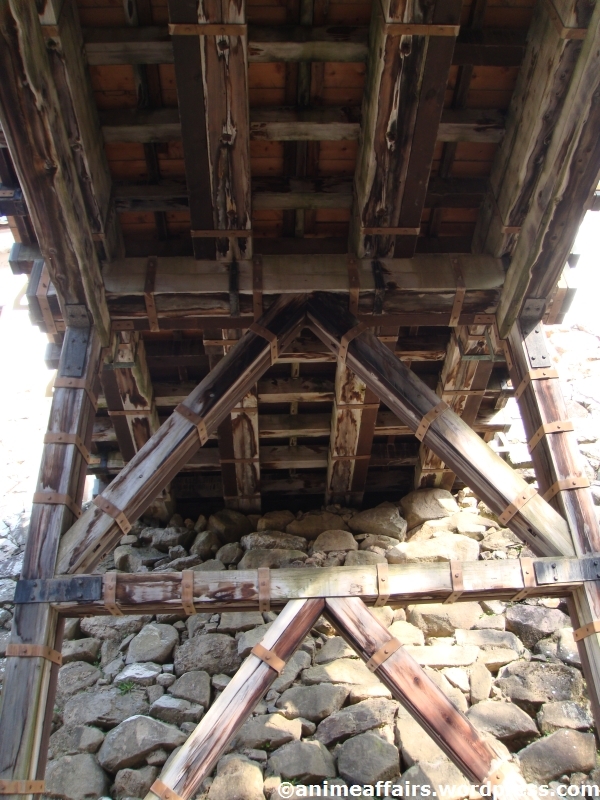 Through the ticket gate near the museum and up a ramp of stone and gravel, a short walk takes us underneath a wooden bridge. Note the gentle upward tilt of the structure (most others I’ve seen are either flat or arches with the same height on either side). I’ve read that this bridge can be demolished in the event of an emergency – which, I imagine, is strictly true of any bridge, so perhaps there’s something in the design that makes the job of taking it down easier. 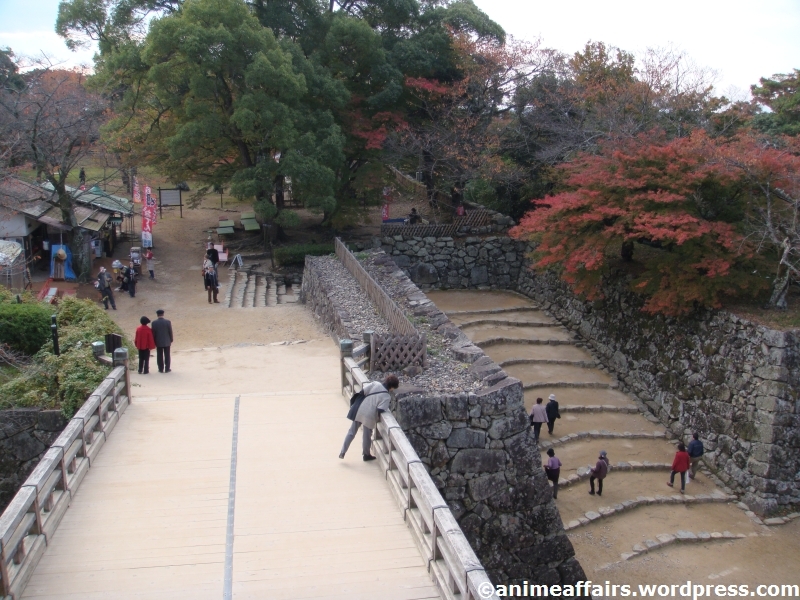 Keep heading uphill and we’ll soon face the Tenbin-yagura, so called because it supposedly looks like a balance scale (tenbin). Over the bridge, then through the gate, and we find the start of the ramp that will finally take us to the heart of the castle compound. 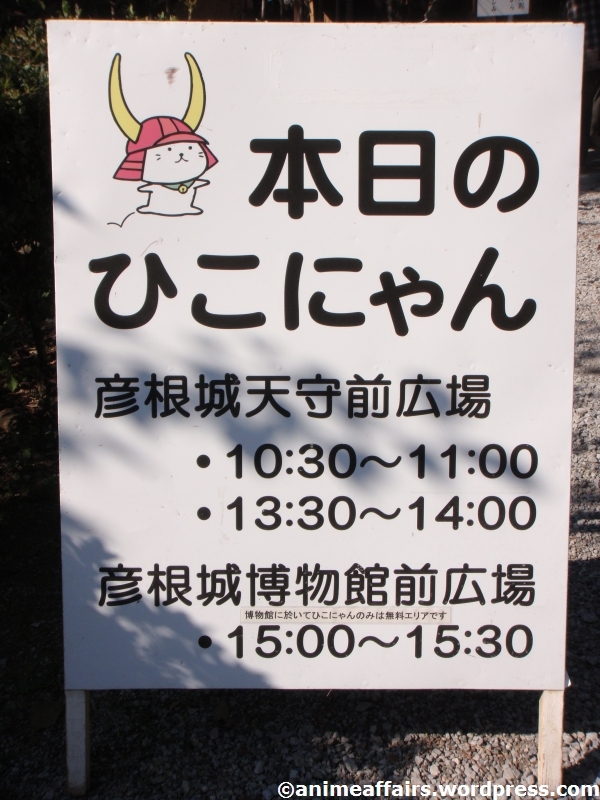 But don’t start climbing it yet – turn around and enter the Tenbin-yagura first for a quick look round. There are some great views of the bridge and its approach from here: a useful feature for guards keeping their eyes peeled for invaders. Now up the ramp towards the castle keep. 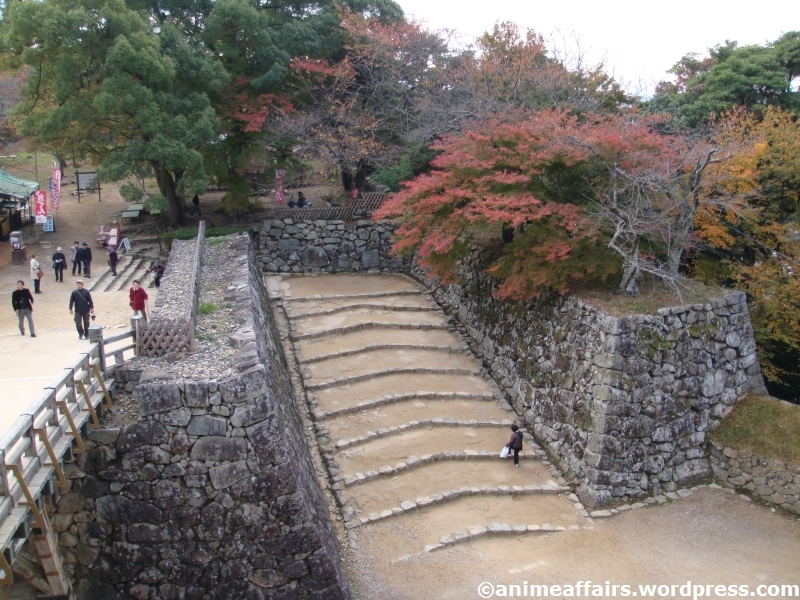 At last, through yet another gate, we come to the star attraction: Hikone-jō’s main tower. 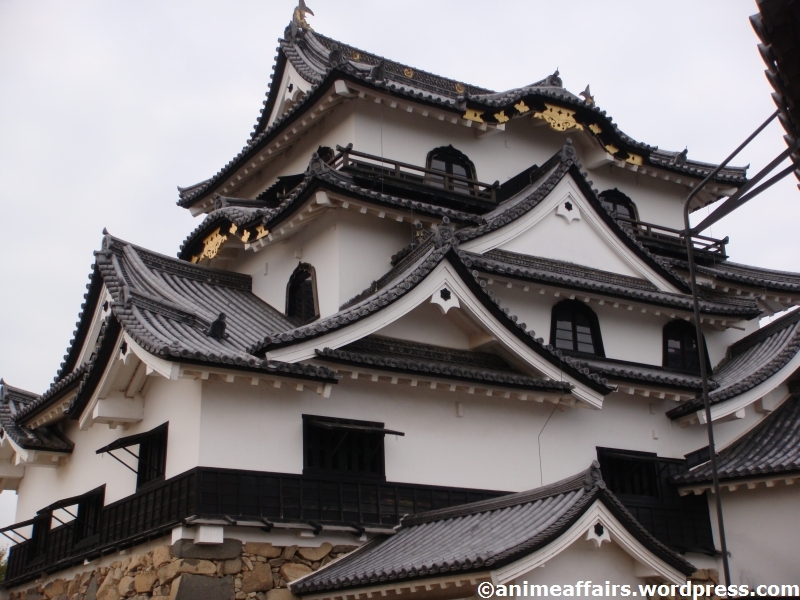 I find it a very beautiful example of traditional Japanese castle architecture, fully deserving of its official designation as a National Treasure. 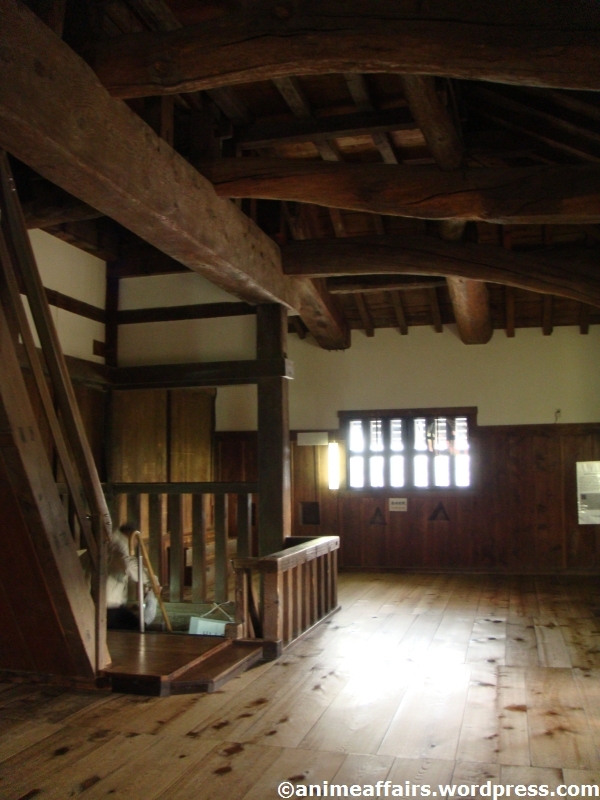 Nevertheless, I can understand (having toured Himeji-jō’s massive central tower in 2009) why it might strike some visitors as a bit of an anticlimax. I remember a couple who came up the ramp just after me; the man gives the keep a once-over and remarks to his companion: “Nanka chicchai ne?” (Rather small, isn’t it?) 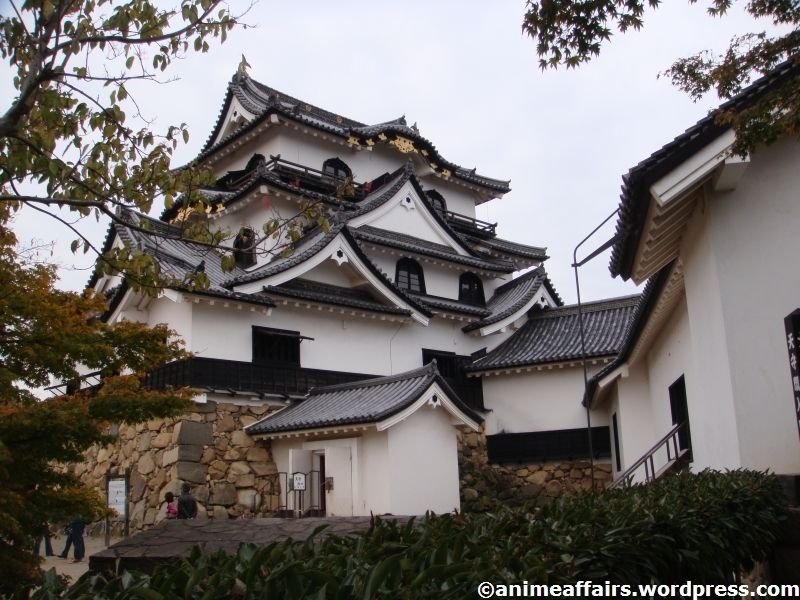 True enough, Hikone’s crown jewel may be a little sprout alongside its gigantic counterparts elsewhere in the country, but I would argue that this is precisely what lends it the touch of charm and elegance that larger fortresses may lack. 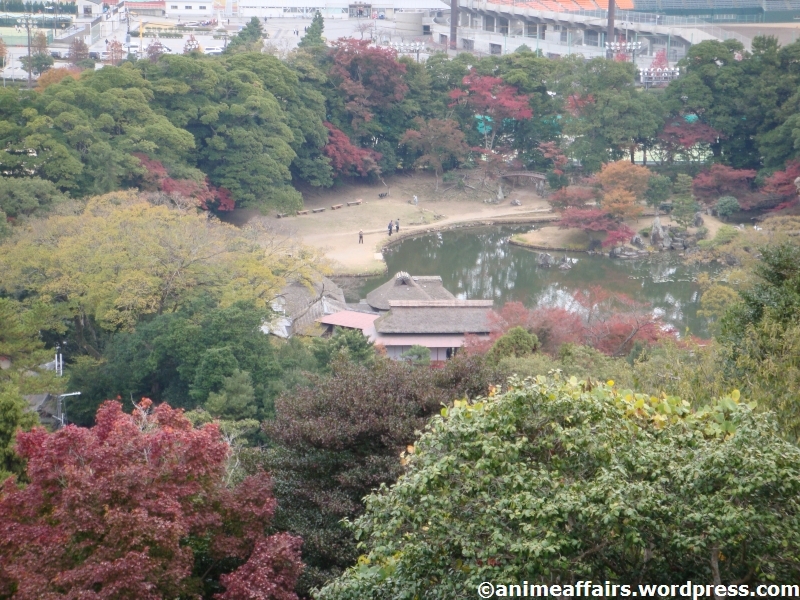 On our way to the castle entrance, glance over the side for a nice view of the nearby Genkyū-en garden. 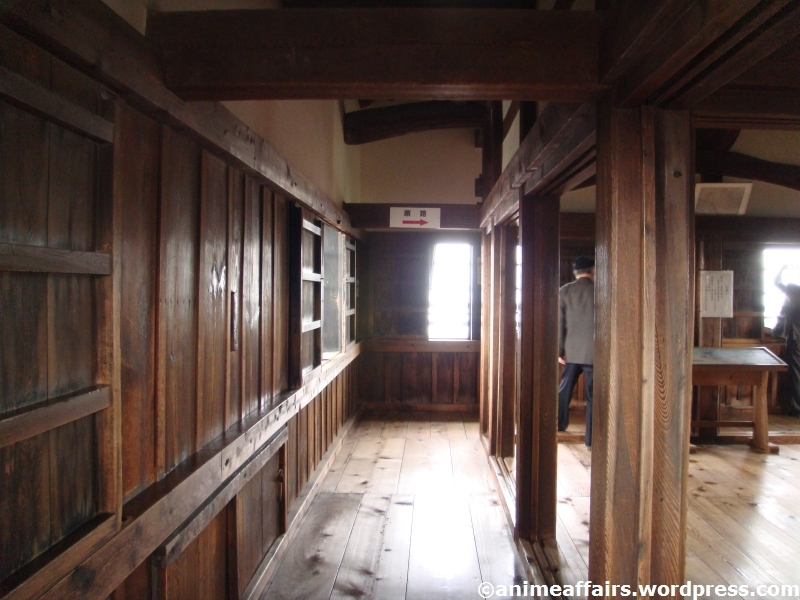 The interiors are more intimate and – with fewer stairs to negotiate – easier to explore than the cavernous bowels of Himeji-jō. 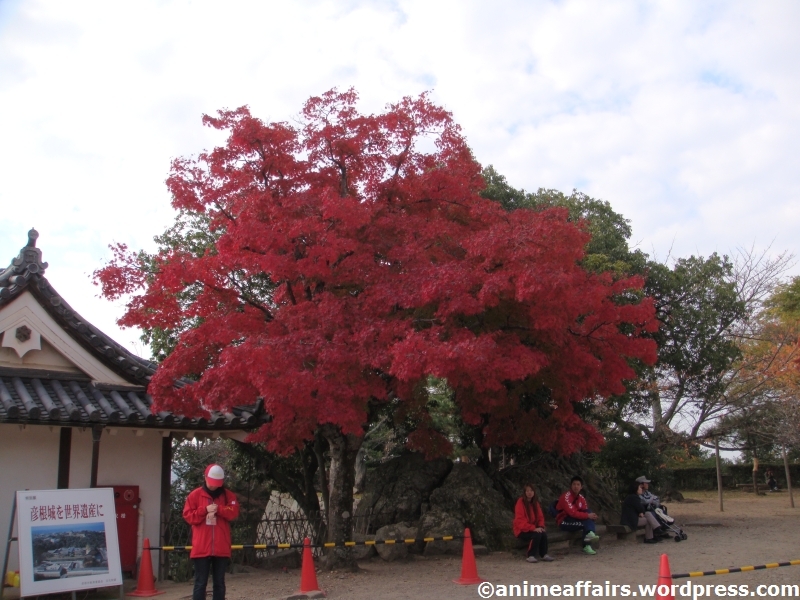 Back out in the open air, let’s take a moment to admire the bright red maple in the forecourt. 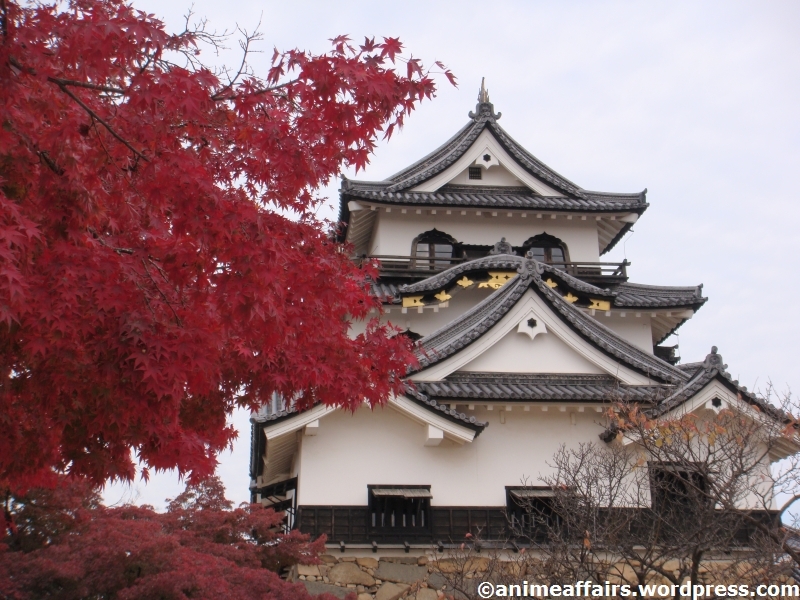 This is late November, after all – high season for autumn colours in Japan. 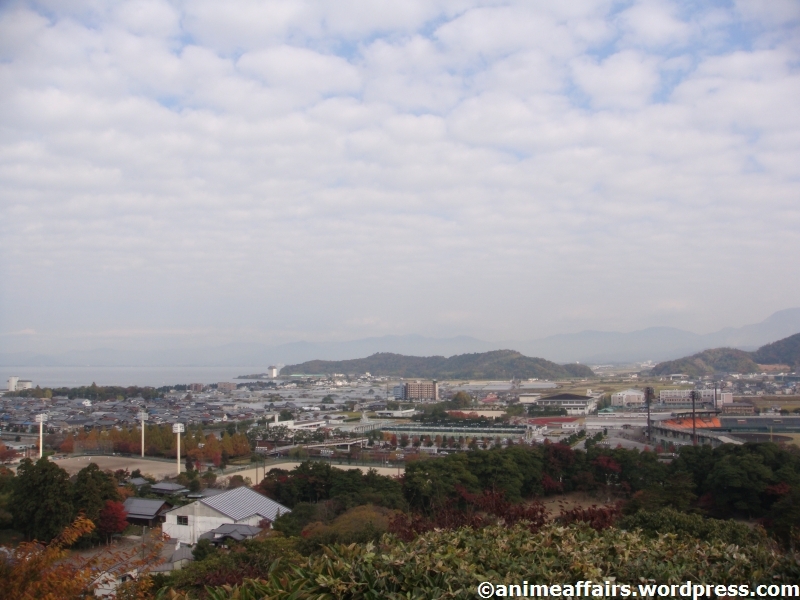 Climb up to the site of the Tsukimi-yagura for great views of the city and the surrounding mountains. 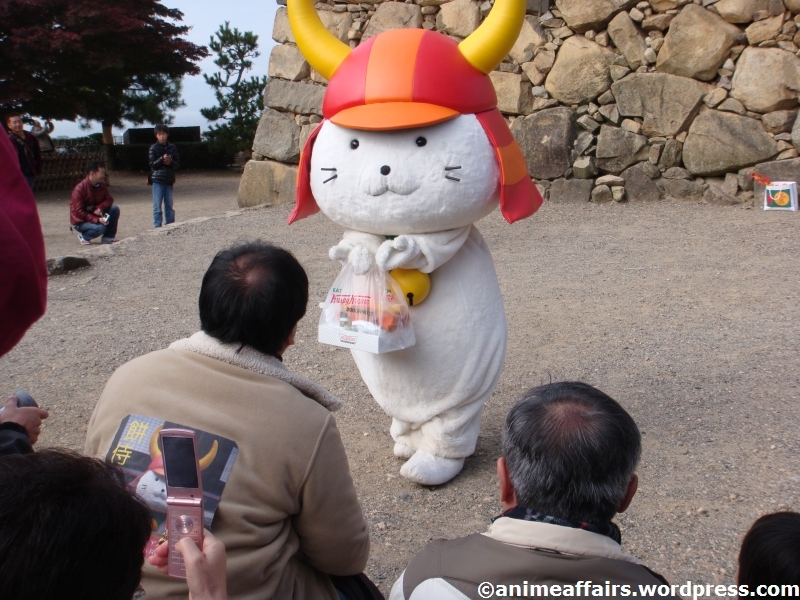 It’s about 10:30 in the morning – just in time for us to catch a glimpse of Hikone’s most famous citizen. Let’s join the crowd near the base of the castle tower. 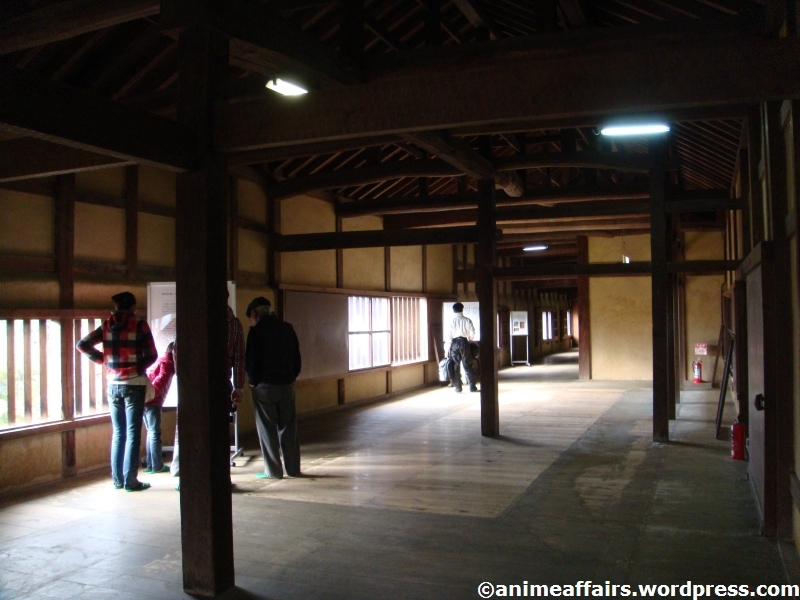 Hikonyan: the second reason behind Hikone-jō’s visitor-drawing power. 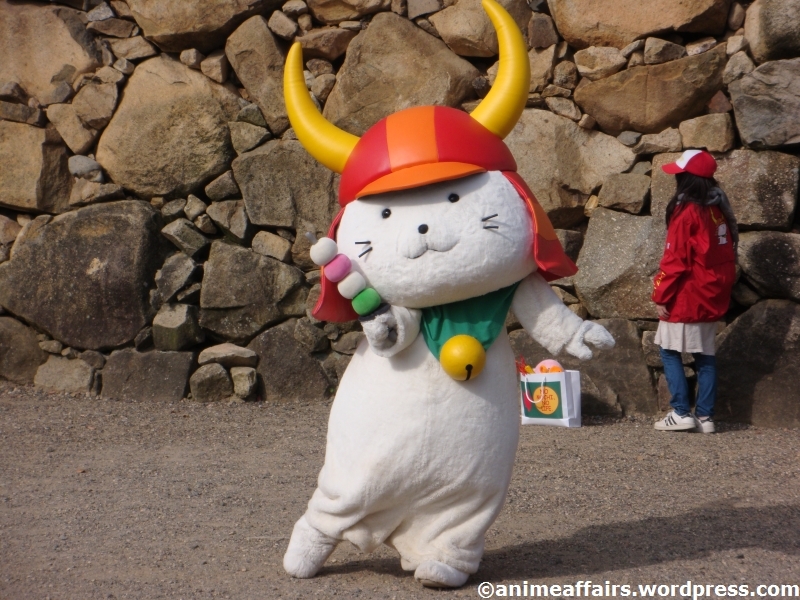 This fluffy samurai-cat-thing prances, dances and poses for its fans’ delight. Happy times for the children, certainly – but wouldn’t this be torture for the adults in the crowd? Interestingly, no. 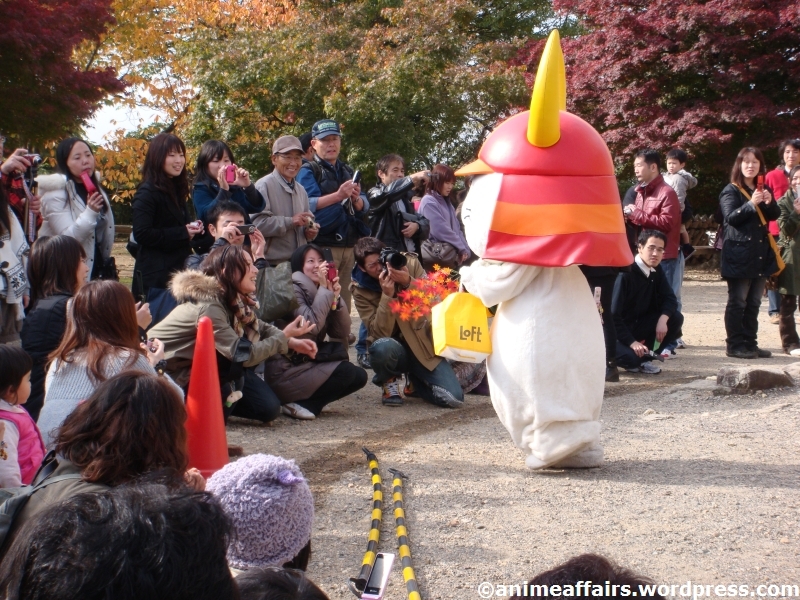 It seems Hikonyan has a lot of admirers in higher age brackets – some of whom are devoted enough to bring presents. Nothing particularly noteworthy in the next shot, but I like the motto printed on Hikonyan’s prop bag. 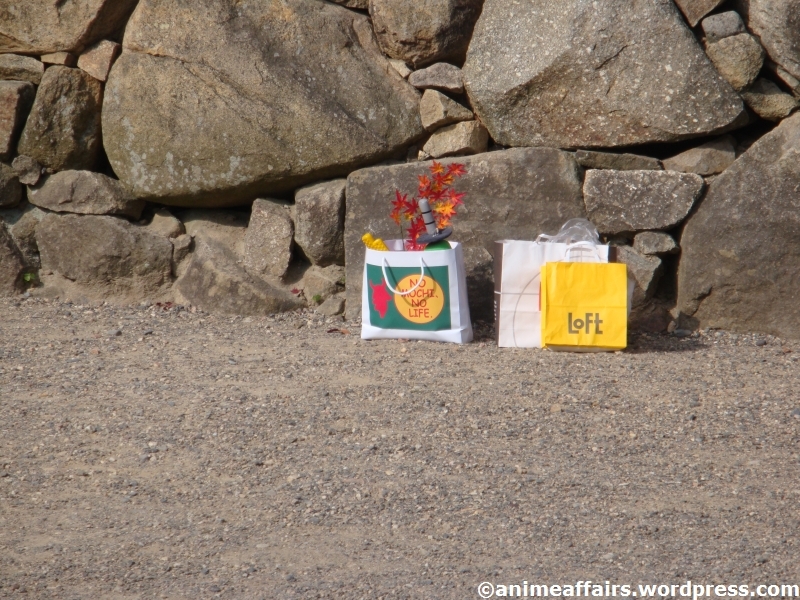 There’s more to see in the tranquil grounds of Genkyū-en nearby, but I have enough material there for a separate post (or a lengthy update to this one). For now, cheerio.